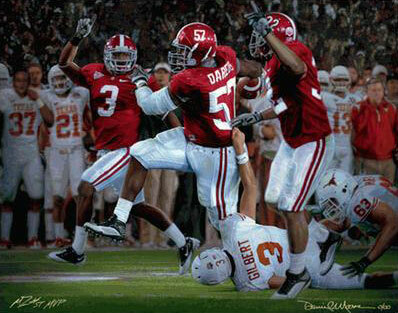 Daniel Moore has created the new and dynamic image of The Pick Six by combining his artwork from two of his original oil paintings. The lower portion depicts Marcell’s “Pick Six” in the 2009 BCS Championship game and is derived from the artist’s recent painting A Crimson Tradition. The artist has painted the Rose Bowl crowd in a separate painting that comprises the top part of The Pick Six. All canvas editions will be signed in oil by Marcell Dareus and Daniel Moore.